The morning prayer habit is a great way to begin your day and get your mind in tune with God and the Holy Spirit. Make this a part of your daily routine and you can even add your favorite prayers in the comments below. Seek God’s face every day and throughout the day. Thank you Lord, for the many blessings You have bestowed upon me, even though I am undeserving. As I stand in Your presence today, I pray for Your blessings upon my life today. Give me this day my daily bread, and bless my work, my studies, and my family. Almighty and merciful Father, protect and guide me throughout this day. May all that I lay my hands on be successful. In Jesus’ name I pray, Amen! Psalm 86:11-12 Teach me your way, LORD, that I may rely on your faithfulness; give me an undivided heart, that I may fear your name. I will praise you, Lord my God, with all my heart; I will glorify your name forever. Lord, I am forever grateful for the abundant blessings You unfold daily in my life. Thank you for bringing me safely through another night. Thanks for all the answered prayers and thank you for the guidance you give me through your Word. Heaven Father, may you continue to give me comfort in my times of trial. Oh Loving Father, help me to be always grateful. Help me to cherish You, my Lord and God. Thank you for this life I have in Christ my Savior. Thank you for the hope of life everlasting. Almighty and Merciful Father, help me to be thankful and appreciative of Your glorious blessings. Teach me to be contented in all things. For contentment leads to a blessed living. May I demonstrate to others a spirit of goodwill and thanksgiving. In Jesus name, Amen! Psalm 59:16 But as for me, I will sing about your power. Each morning I will sing with joy about your unfailing love. For you have been my refuge, a place of safety when I am in distress. Almighty and ever-merciful Father, I feel weak, bombarded by the stresses of life. But you, oh Lord, are my strength and my shield. As long as I am in this world, there will be trials and tribulations. Yet, I can rest my head in your bosom, and lay my burdens before you. For You are not only with me but in me, and I in You. Abba Father, I pray to be Your humbled vessel. As You fill and fortify me with your Holy Spirit and Your armor of warfare, may I speak Your words of love, forgiveness and compassion, and bring the lost to receive Your regenerating Grace and mercy. In Jesus mighty name I pray, Amen! You would also want to read the book: Command The Morning as you take control of your day and transform your mornings and your life! Almighty Father, grant me patience today in my dealings with others. Give me grace and understanding. Let me be patient as I await the answers to my prayers and the revelation of your blessings in my life. Help me to always trust that Your timing is perfect and always in my best interest! Lord God Almighty, open my mind and heart to listen to You speak to me as I pray. I ask for Your Holy Spirit’s guidance in all I say and do. Heavenly Father, You are worthy of all praise and glory. I bring to You my despairs, my failings and all my regrets. I trust that You will mend all of them. Grant me healing and joy, and Your peace that passes all understanding. Thank you for molding me into who I am today. You are the potter, I am the clay. Continue to mold and guide me as I become more of the person you created me to be, in Jesus’ name, Amen! Almighty Father, we love You and we adore You. Through the love and sacrifice of our Lord Jesus Christ, we have been brought closer to you. Inspire and bless us with Your Holy Spirit, Lord, that we reflect Your image in all we say and do. Almighty Father, we thank You for Your great promises. When we are weak and faithless, help us Lord to remember and boldly trust in Your promises. Amen! Psalm 140:4 Guard me, O LORD, from the hands of the wicked; preserve me from violent men, who have planned to trip up my feet. Today I bless the Lord for what he has done through Jesus Christ his plan and thoughts he has for us (Jer29-11)our good shepherd (John10-11)guide us with is Spirit (Gal5-22) and give us the fruit of it. I thank you for being able to see,hear,touch,feel and walk this morning. I thank you Lord,for always being with me,bring peace in my heart and comfort me with Your love. Dear Father God,please protect and guide me to start my day. Every step I take is ordered by You dear God.Amen. Thank You Lord Jesus,for refreshing and renewing my mind and my heart,and give me a new life. I thank and praise the Almighty God for your life and for all your are doing to keep us clinging to God. Everyday l wait patiently for your manifestations. Just claiming your prayers make me feel belong and thus connected to God. Thank you. I praises the almighty father each and every day and night, when I wake up and before I go to sleep. All the psalm I read uplifts to do all the my almighty father ask of me to do in Jesus name I pray amen. Glory to God on high. Help me Lord to have a bless day. Thank you father lord for waking me up this morning. Help me to continue living in your kingdom. I want to thank you for the blessings you have bestowed on my family and I. Lord, I am praying for a softer heart, make it yours Father. This I ask in your name, amen. Dear lord thanks for the new day. Thank you for another day. Thank you for the gift of life. I love you. I praise you. I honor you all the days of my life. Shelter me under your loving light from all evil. All glory and honor are yours forever and ever. Amen. And thank you for the guidance You give me through Your word. Thank you Lord Jesus,to give me comfort,in my times of trials. I love You dear Lord Jesus. I will follow Your word to do everything in my daily life. You are not only with me,but in me,and I in You. Prayer request for the removal of all wicked imaginations from the enemy’s alters. I thank Godfred for that beautiful prayer ,may he also bless you and your love ones. Thank you, Godfred, what a beautiful prayer. May God bless you and yours with the strength to endure. I praise and give You many thanks my dear Father in Heavenly place. I thank you for the dawn of this beautiful morning,and thank you for the blessings You pour upon my life. Dear Lord Jesus,Please grant me healing and joy,and Your peace that passes all understanding. I only wants to be the person You created me to be. I will follow Your Will and Your Word in my everyday life forever and ever.Amen. I love You dear God,I put my trust in You everyday. I start my day with You,and walk with You,with praise,and give You thanks. I will find peace in this beautiful day. Thank you Lord for the strength and patience you have given me as a single mother each and every day. I give You thanks and praise You my dear Father in Heaven,for today I still alive,still can see this new bless day. I surrender all to You dear Lord. I pray that my brother gets resolution soon to the hardship he has been going through for too many years so he is “free” to live his life again. He is tired and it hurts to watch him suffer. Dear Brenda, I am in agreement with your prayer. And, I hope that things have gotten better or are getting better. We praise God for His healing power to restore and make things new. Amen. Dear Father, thank you for keeping me and my family and friends safe, we bless your holy name, Amen. I thank you to my Dear Heavenly Father,for this abundant blessings.As we bless others,with what we have.And thank you for the many blessing You continue to bestow upon me.And thank you for this prayers,came in time each and every day,to help me get stronger in the Lord.Thank you for teaching me to pray and obey You in all things.In Jesus mingthty name.Amen. Dear Heavenly Father my Lord and God.I thank you for this life. I have in christ my Savior . Teach me to be contented in all things. Thank you Lord,for you always be with me in everything I do. Thank you Supernatural God to know that everything got your timing and sometime I hard to understand a lot of unexpected things happen into my life. But Lord I know that all things work together for good to them that love God, to them who are called according to his purpose. Do help me pass this test and be a blessed son you want me to be. In Jesus Name I pray. Amen! Thanks. More grace to you and the team. I’m in need of prayer. I’m going through financial hardship. The debts I have are more than my wages and I’ve been seeking God’s hand on my finances but all I hear is silence and feeling as if I’m at a stand still. Regardless I have decided to wait on the Lord and this is one of the most painful and hardest things I’ve ever heard to do. As we speak my rent for the month is not paid and some debtors have been constantly calling about some debts that are in arrears. I feel so exhausted and tired from all this and have just been declaring and decreeing a financial breakthrough and a money miracle and need someone to pray and believe with me. God says he’s a way maker and a miracle worker and I believe He will make a way even where there seems to be no way. He Will definitely make a way. He’s not deaf to your request and will do in the most appropriate manner, don’t be discouraged to keep asking and hold forth and please do not look for money in an unholy way. Our God is awesome!! God will make a way. I’m going through a situation very similar to yours right now as well and what I can tell you is that the more you trust God, the more He will be able to lead you. Don’t take your eyes off of Him. Your situation will fade away like how a hot knife melts butter; I promise you! Dear Valentine, I am in agreement with your prayer. May God bless you and shower you with all that you need. I pray for you my sister in Christ. May your faith grow in the Lord daily. Don’t be discouraged as Jesus warned us about the storm. In the midst of the storm, worship and praise the Lord. For the Lord Jesus is good whether we go through the bad or the good. I too have financial difficulty, but it’s not stopping me to worship the Lord. I pray that whatever is holding your financial breakthrough to be manifested, may the Lord Jesus bring it to the light in Jesus name, Amen. Amen! This is the day that the Lord has made and we will rejoice and be glad in it. We choose to give Him thanks no matter what lies before us. Amen! ??? ?i trust and loved my God., Amen and Amen???? Thank you lord for watching over us!!!! We praise your name and you make us victorious. God is good. There is power in the name of Jesus!!! Whoever is in doubt, please stop. Just have faith and believe. I can testify my reasons. I give You all the praise and glory. I place You and hold You in my heart. I am so grateful and give thanks to God everyday for He is good,for always help me to throughout my day. Thank you Lord,to give us comfort,guide us and lead us in everything we do,or in our trial times. 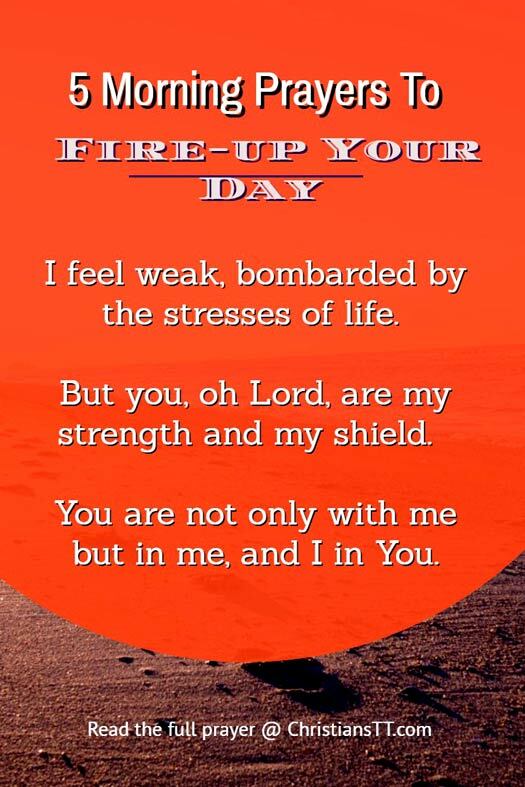 Thank you so much for this wonderful prayer,to strengthen my day. I praise You today my dear Heavenly Father,for You are our Lord,my Rock,my strength,and my everything. Thank you for Your faithfulness in my life. Dear God,Teach me to embrace the new things You have in store for me. I place You and hold You in my heart,no one could ever fill. Help us,learning to forget,what is past, yesterday is gone,embrace today. with me,when I need You. Thank you to bring me God’s word,each and every day to strengthen my day. Thank you Lord Almighty for Christiantt… Thanks alot for all these prayers. Praise the Lord for you all. God bless you more and more. Wanda, pray hard with deepest sincerity and God will answer your prayer for sure. I want to give thanks to my Lord God Jesus Christ,for today You pour Your abundant blessings rain down upon me, so that I can walk in victory all the day in my life. Thank you Lord, for each and every day,help us to do positive attitute,and the life gives us goodness,strength,peace and joy. Thank you so much for bring me God’s word every day to strengthen my day. Thank you, Father for blessing me and my family! May many amazing doors continue to open up for us! I am so very grateful to have our God Lead my life. His presence is powerful as He removes trouble from my path. I come to You today my dear Heavenly Father,wants to give thanks for all the answered prayers.And thank you for the guidance You give me through Your word. And thank you for bringing me safely through the night.Oh.Lord,help me to be thankful and appreciative of Your glorious blessings. I am so grateful for all You have gave me each and everyday in my life. Thank you, Lord for your great and wonderful blessings upon my life. Amen…to God be the glory!! We did send you instructions via email, but as you did not use your proper email, the email was returned. You are welcomed, Ramaj. Have a blessed day! Thank you, Scott! Continue to pray and build yourself up in the Lord. May the Lord Jesus bless you for blessing us with daily prayers to keep us going. Everytime I receive a notification about prayer requests, it brings a smile to my face. I thank you Dear Heavenly Father, to give me comfort daily in all my troubles. You are not only with me but in me, and I in You. And make my day become better each and every day. I look forward to reading each prayer daily. In Jesus mighty name. Heavenly Father I am so thankful for my job, and I want to praise and thank You that through my job I am enabled to provide for my daily needs and necessities especially for my family, and I give You all the praise and glory. I pray that I may work in my job in a manner that is honoring to Your name, and keep me willing and able I pray.. to perform all the tasks and duties that are set before me, with integrity and diligence as well as with teamwork and synergy. I am grateful for the many lessons that You are teaching me in my workplace in which I need to be a constant living epistle to my co-workers who are not Christians. Thank you also for guiding me to render honest service from day to day to every people I have contact with. I give You the glory, power, praise and worship in all I say and do in Jesus name I pray. Amen! Thank you for threse wonderful prayers.May God bless you to day and always. Almighty and merciful Father,protect and guide me through out this day.May all that I lay my hands on be successful. In Jesus Name I pray,Amen. Thank you Lord for blessing me and mine family and love ones to see another day, that we have never seen before. Thank you for loving us, for keeping us, for shelter and for your provisions Thank you for healing us when the doctors said there was no cure. Thank you for mending our broken marriages, for restoring our finances. Thank you for making a way where there seemed to be no way. We give you all the glory, the honor and the praise! Now be with us as we go throughout this day, keep us out of the hands of the enemy. Shelter us from all hurt, harm and danger. Encamp your angels around our lives and our homes. In Jesus precious name I pray, Amen and Amen. Let it be so, in Jesus name!! Thank you for a word in due season! Thank you for these prayers every morning, I really appreciate them. God bless you. Thank you Jesus for your grace and mercy amen. I agree these morning prayers are a real connection with God and an opportunity to thank and praise our creator each morning! Amen to all these prayers, they are soooo….reviving. Thank you Lord in Jesus Mighty Name Amen. Amen! Thanks for these uplifting prayers. I really love those prayers in it helps me throw the day with the Lord. Dear Father in Heaven Lord Jesus, Thank You for opening my eyes so I see the world…without you in it and it mourns me….Before You saved me…I felt unempathetic towards a life with You..I Thank You that since I’ve started to attend Church Services again for a year now…I see the difference in me now, a year later…and I BELIEVE You are still working on my life….I pray You Change Me…And That I Continue to Trust You Completely…Because without getting to know you intimatedly Lord, how can I DESIRE to follow You? Thank You for my Church, The teachings, interest to Understand That You Created Us in YOUR IMAGE of: PERSONALITY, MORALITY AND SPIRITUALITY…Thank You for Teaching me to Pray and Obey You in ALL THINGS…IN Loving Jesus Name…Amen…. Thank you God for the many trials I face in life. Thank you that I know God, You are in control. Dear lord I’m lost. I don’t know where to turn. Lead me to the right path. I’m suffering, lord. I have everything, but I have nothing. Help me find peace. Praying for you, Anton. The Lord will turn your life around suddenly. He loves you . He made you. God Bless , my brother. As a sidebar to this prayer I must re-mind us all that we rule and rein with Christ and are absolutely deserving of every blessing from Him. To say we are ” undeserving” is untrue. Thank you for these wonderful prayers. Everything is falling apart. Work, family, finances. But still Lord, I’m holding on to you. Everyone is abandoning me, though I have done good my entire life, to everyone around me, even the poor animals. I don’t expect anything back from anyone, but sometimes I don’t understand. I am unhappy, heartache, worried, the future for my children, but I am also so grateful for all You give me every day. Please Lord, help me out, you know my heart. The enemy wants you to be discouraged. He sees your faith and wants to attack it. The only way “he thinks” he can attack your faith is creating chaos in your life. I ask of you to not give up on the Lord for its is the Lord Jesus who is the only one who can. If we don’t have Jesus, we have nothing! Don’t give up and don’t turn your back on Him. He loves you and is watching you. Just draw yourself near to Him regardless of how many problems is mounting up. All believers around the world are suffering although the Lord gives us peace and joy through the midst of the storm if we allow and accept Him to. God bless you and your family Anton.